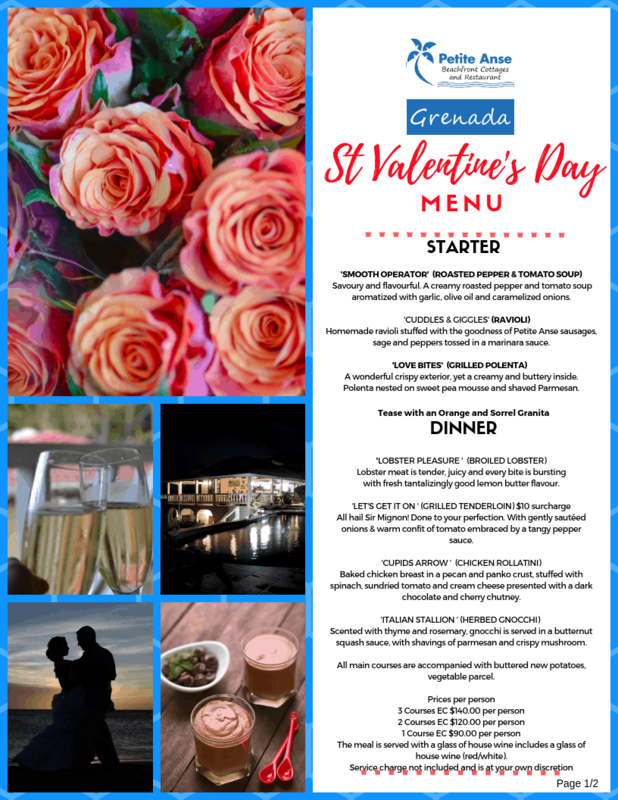 If you’re looking for somewhere to enjoy St Valentine’s Dinner 2019 in Grenada with your sweetheart, then you’ve come to the right spot. 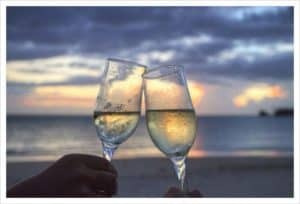 On the evening of Thursday February 14th 2019 we will be hosting our annual celebration of love and serving the food of amour. Savoury and flavourful. A creamy roasted pepper and tomato soup aromatized with garlic, olive oil and caramelized onions. Homemade ravioli stuffed with the goodness of Petite Anse sausages, sage and peppers tossed in a marinara sauce. A wonderful crispy exterior, yet a creamy and buttery inside. Polenta nested on sweet pea mousse and shaved Parmesan. Lobster meat is tender, juicy and every bite is bursting with fresh tantalizingly good lemon butter flavour. All hail Sir Mignon! It’s done to your perfection. With gently sautéed onions and a warm confit of tomato embraced in a tangy pepper sauce. Baked chicken breast in a pecan and panko crust, stuffed with spinach, sundried tomato and cream cheese presented with a dark chocolate and cherry chutney. Scented with thyme and rosemary, gnocchi is served in a butternut squash sauce, with shavings of parmesan and crispy mushroom. All main courses are accompanied with buttered new potatoes, vegetable parcel. Smooth and creamy Grenadian chocolate mousse with Chantilly cream and grated nutmeg. Enjoy this moist and delicious French Vanilla cake with a mixed fruit compote. To book your table, call 442 5252. We look forward to seeing you on the night. 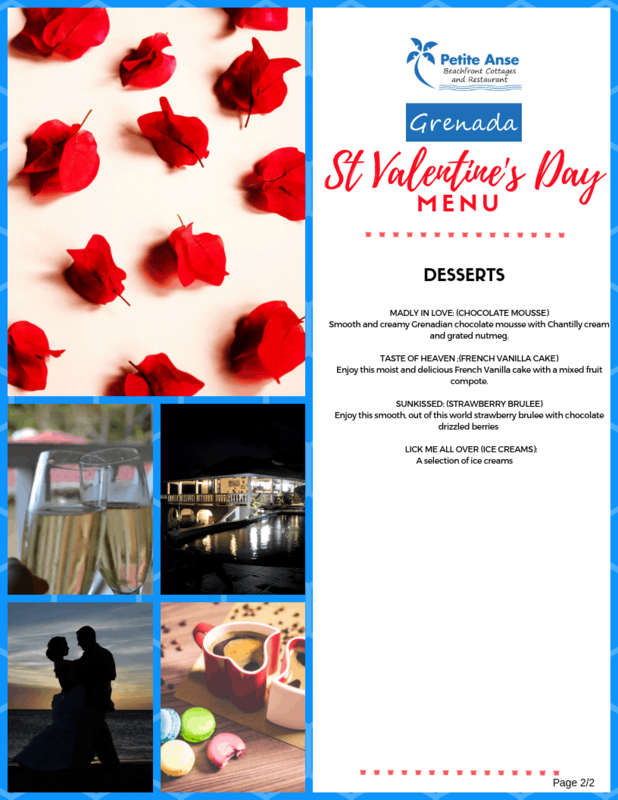 We offer one of the best and most romantic Valentine’s Day Dinner menus in Grenada.